According to a report on trending foods, the interest in vegan cuisine is growing, and an estimated six percent of Americans eat an animal-free diet. While there are many benefits to eating a vegan diet, you don’t need to be a vegan to enjoy some of the unique foods available. 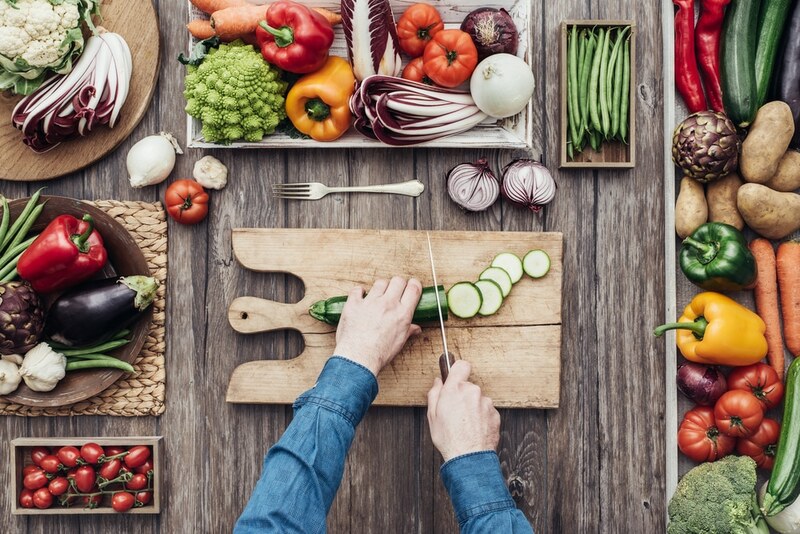 Whether you’re interested in switching to veganism or just want to incorporate some new recipes into your life, we will give you a quick overview of the vegan diet and share some nutritious and flavorful vegan recipes. Before we jump right to sharing some healthy vegan meal ideas, it’s a good idea to give you a quick overview of veganism. Despite its growing popularity over the last decade, the vegan diet is nothing new. Veganism, in short, is the practice of “minimizing harm to all animals.” This means that a true vegan diet consists of eating animal-free food, not wearing clothing made of leather, wool, silk, or fur, and not using products containing beeswax or lanolin. While many people choose to become vegan for ethical, ecological, and personal reasons, some choose to eat an animal-free diet due to the health benefits. People have practiced veganism for decades (and probably centuries), but it wasn’t until 1944 when it was given a proper name by Donald Watson. Veganism is often mistaken for vegetarianism, and while there are some similarities, vegetarians don’t necessarily restrict themselves from using dairy, eggs, or honey; some may even wear wool and use beeswax. Although vegan diets often have a bad reputation for being too difficult to follow, too boring, and full of limitations, a well-balanced vegan diet is full of variety and is relatively easy to adopt and follow. You don’t need to be a vegan to appreciate and enjoy vegan food dishes, but if you do plan on transitioning to veganism, there are some things you may want to keep in mind. Overall, a vegan diet is healthy and has many health benefits from reducing your joint pain to lowering your risk for certain diseases like diabetes or cancer. Some vegans are able to eliminate their need for certain medications and other supplements. As with all special diets, it’s important to remember that your vegan diet may be different from someone else and you may (or may not) experience different types of benefits. If you take medication for a health condition, never stop taking it without talking with your doctor first. Although an animal-free diet is typically full of healthier options, there are plenty of vegan foods that may be classified as “junk” foods and provide little nutritional value. Since many people automatically assume that vegan is synonymous with natural and healthy, it’s important to understand how to carefully read labels (just as one might with other types of diets). Like any diet, nutritional balance is essential when practicing veganism. What makes a balanced diet without dairy, eggs, and meat? Ideally, a vegan diet should include two servings of a healthy fat, two servings of fruit, four servings of vegetables, five servings of legumes, nuts, and other proteins, and six servings of grains. Based on your needs, your servings may differ. To ensure that your vegan diet is balanced, many experts recommend talking with a nutritionist who specializes in veganism, particularly as you transition to a vegan lifestyle. Browse the aisles of your local health food store, and you may be taken aback by the prices on vegan-friendly products. While some vegan items may cost more, many products such as vegan butter are about the same price as butter containing dairy. Pre-packaged vegan foods may be tempting, but they are often more expensive than if you were to cook a meal from scratch. Look for items in bulk, check out your local farmer’s market, and even consider shopping at wholesale or big box stores for some items. As veganism continues to grow in popularity, you’re likely to find vegan-friendly foods most anywhere. As you begin to familiarize yourself with vegan-friendly foods, you’ll probably find yourself struggling to find substitutions for some major food staples like dairy products. Let’s discuss some of the common substitutions. Keep in mind that as you explore recipes, most of them will tell you what to use as a vegan alternative. Browse the aisles at your local grocery store, and you probably notice all the milk alternatives. Soy, rice, oat, hemp or nut milk are good alternatives and typically can be used as a 1:1 ratio in any recipe. Not sure what type of milk to choose? Do a little taste testing or follow the suggestion per the recipe. You can purchase vegan cheese at most stores, but it can be a little expensive. Cashews and tofu are often used as a substitution. Check out this vegan nacho cheese recipe. Even though there are several vegan kinds of butter to choose from, you can easily substitute “real” butter with sunflower or olive oils. Eggs are a versatile ingredient in baking and cooking but can be a bit of a stumbling block for someone who is new to veganism. Tofu scrambles are a good alternative for scrambled eggs while applesauce or a “flax egg” (one tablespoon of flax meal with three tablespoons of water) are good for baking. If you are using a vegan recipe that calls for a “binding” ingredient, rolled oats or oatmeal, tomato paste, and nut butters are good alternatives to chicken eggs. Now that we’ve discussed some of the basics of veganism and a few good alternatives, let’s take a look at some easy vegan meal recipes. Preheat the oven to 375 degrees (F). This recipe is quick and easy if you have a food processor (a blender may work well, too). In the food processor, combine the chickpeas, garlic, and rolled oats. Pulse for 5 to 10 seconds until the ingredients are finely chopped ( the consistency should be similar to dough). Transfer the contents to a large bowl and mix in the herbs, salt, nutritional yeast, lemon juice, and no more than one cup of shredded zucchini. Stir until mixture is well-combined; you can add flour or nutritional yeast if the mixture too wet. Line a baking sheet with parchment paper and roll heaping tablespoons of the mixture into balls (you should end up with about 12). Arrange the balls on the baking sheet a few inches apart and bake for 25 minutes. Cook the pasta as directed and once the “meatballs” are light golden brown, remove them from the oven and set aside. Serve the zucchini “meatballs” with warm pasta and marinara sauce. Once the potatoes are cooked, mix all the ingredients together and serve. You can add more vegetables, like peppers, to add a little more variety. Blend all the ingredients in a food processor or blender until smooth. Divide into two dishes or glasses and chill the pudding for at least two hours or overnight (although you can enjoy the pudding right away). Add your favorite vegan toppings or vegan-friendly whipped cream or enjoy on its own. Now that you know the basics of a vegan diet and some of the common substitutions when cooking and baking vegan foods, start browsing the Internet or cookbooks for recipes. You can even ask some of your fellow vegans for some of their favorite vegan recipes. Don’t forget to be creative and open to new foods and flavor combinations.